This week Fred is joined by Chip Cella of the B-Team Podcast to discuss one of the few colorful platformers born completely from the 3D generation, despite the first game playing on a 2D plain. Ubisoft’s Michel Ansel all but saved the then struggling developer/publisher and gave way to a challenging but fun series starring a character with no limbs. Rayman wants to be a strong classic platformer, and it’s really a shame that the steep difficulty curve will turn off even the most determined of contemporary gamers, because from an aesthetic and game design perspective this game should be appreciated. Alas Rayman has been ported to console after console and seen commercial success, but I wonder how many people have actually experienced most of what this title has to offer. During the mid 90s there was no shortage of consoles – both the 16-bit generation and 32-bit generation were coming to be, not to mention CD consoles – and Rayman was caught right in the thick of it. Not only that, but thanks to Mario and Sonic, platformers were among the highest in popularity behind fighting games. The title began life as a brainchild of Ubisoft creative director Michel Ancel (who is also responsible for cult favorite Beyond Good & Evil) and the then struggling developer/publisher bet the house on his creation and won. 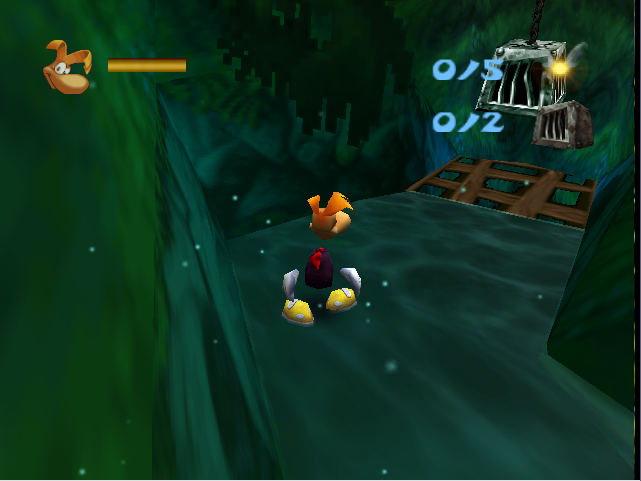 Rayman started life on the Super NES as a two-player title based on various cultural fairy tales and eventually it was decided that the game would receive a cartoon makeover with better animation and subsequent move to the Playstation CD add-on for the SNES (read that story here). When Nintendo announced the cancellation of both the Playstation and Phillips CD projects Ubisoft wanted to move to the Jaguar thanks to its specs and eventually chose the Sony Playstation as the lead console. As you can see, the game was already bouncing from console to console.